This is a rare chance to re-discover a contemporary account of a military conflict which took place a Century ago. “The Agony of Belgium”, written in 1914 by Frank Fox, a war correspondent veteran of the Balkan Wars, precedes the trench warfare of the Great War. It recounts events that the modern European mind would probably wish to forget. 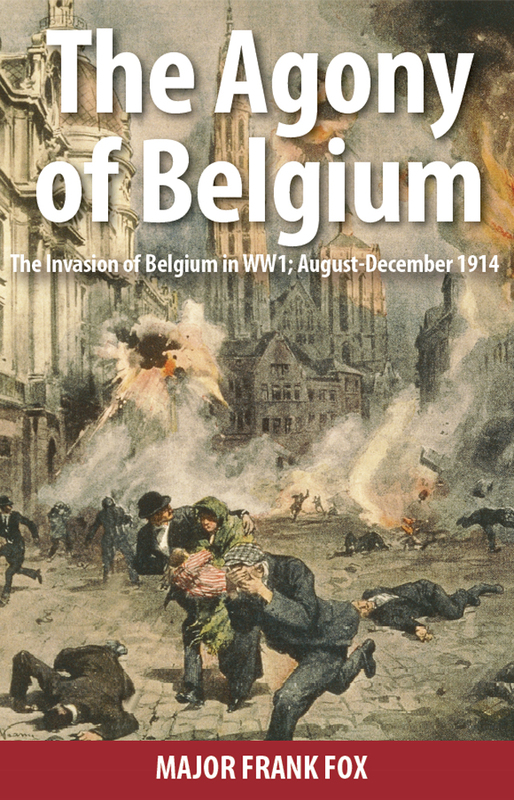 The bravery and resilience of the relatively new and untested Belgian Army, following the rejection of the German Ultimatum by the King, deserves a wider audience. Throughout this account the courageous and noble qualities of King Albert in the dark days come to the fore. Whether at the Front as an active Commander-in-Chief; with his people during Zeppelin raids and artillery bombardments at Antwerp; declining refuge in France after the retreat from Ostend; or rallying his troops for rearguard actions his conduct was of the finest. For these first 4 months of WW1, Fox used a bicycle to travel extensively (up to 75 miles/day- including an escape from Brussels over the border to Holland) to the various fronts admiring the determination of “our” Army against insuperable odds, and lamenting the miseries heaped upon the populace. His account of the “frightfulness” of the events in Louvain against the civilian population- including women and children- and the sacking of cultural treasures was not at first believed by Officials in Antwerp. However his reporting of Zeppelin raids helped to arouse public opinion in the United States. Having been turned over as a spy by civilians to the French cavalry, he prevailed to produce a unique insight into the ebb and flow of the campaign. From reporting the use of civilians as human shields at Alost, to suffering the effects of the final bombardment of Antwerp from which he escaped by boat, and the turning of the tide after the battle of the Yser, Fox provides vivid descriptions of a terrible, and little known, conflict.